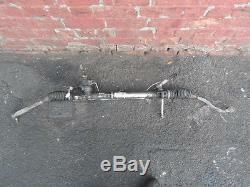 CITROEN C5 2008-ONWARDS POWER STEERING RACK. BEEN FULLY TESTED IN PERFECTLY WORKING ORDER. ALL ENQUIRIES ON THIS ITEM PLEASE CONTACT VIA MOBILE OR MESSENGER. FREE P&P TO UK MAINLAND ONLY. COMES WITH STANDARD 30 DAYS GUARANTEE. The item "CITROEN C5 2008-ONWARDS POWER STEERING RACK 9687179480" is in sale since Thursday, October 27, 2016. This item is in the category "Vehicle Parts & Accessories\Car Parts\Suspension & Steering\Steering Racks & Boxes". The seller is "twinpipe94" and is located in merseyside. This item can be shipped to United Kingdom.